Gastroschisis is a birth defect in which an infant's intestines are outside of the body because of a hole in the abdominal wall. 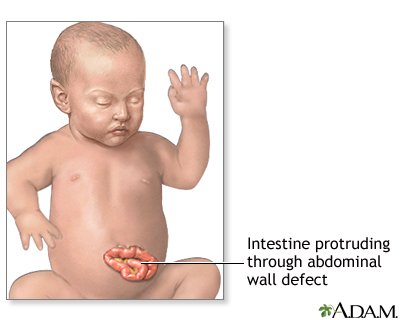 Babies with gastroschisis are born with a hole in the abdominal wall. The child's intestines often stick out (protrude) through the hole. The condition looks similar to an omphalocele. An omphalocele, however, is a birth defect in which the infant's intestine or other abdominal organs protrude through a hole in the belly button area and are covered with a membrane. With gastroschisis, there is no covering membrane. 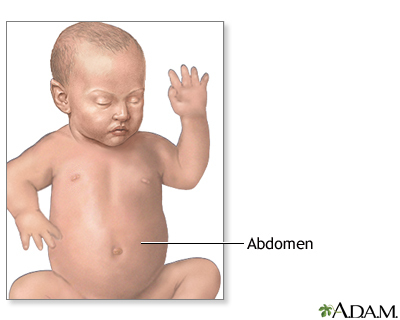 Abdominal wall defects develop as a baby grows inside the mother's womb. During development, the intestine and other organs (liver, bladder, stomach, and ovaries, or testes) develop outside the body at first and then usually return inside. In babies with gastroschisis, the intestines (and sometimes the stomach) remain outside the abdominal wall, without a membrane covering them. The exact cause of abdominal wall defects is not known. 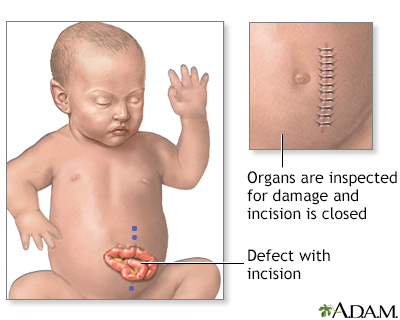 Babies with gastroschisis usually do not have other related birth defects. A gastroschisis can be seen when the baby is born. There is a hole in the abdominal wall. The small intestine is often outside the abdomen near the umbilical cord. Other organs that may also be seen are the large intestine, stomach, or gallbladder. If the intestine is damaged, the baby will have problems absorbing food. Prenatal ultrasounds often identify infants with gastroschisis before birth. While pregnant, the mother may have shown signs of too much amniotic fluid (polyhydramnios). A prenatal ultrasound often identifies the gastroschisis. Polyhydramnios occurs when too much amniotic fluid builds up during pregnancy. It is also called amniotic fluid disorder, or hydramnios. If gastroschisis is found before birth, the mother will need special monitoring to make sure her unborn baby remains healthy. 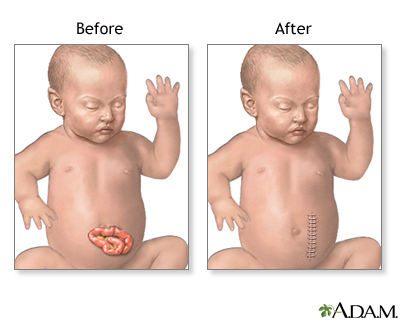 Treatment for gastroschisis is surgery to repair the defect. The surgeon will put the bowel back into the abdomen and close the defect, if possible. If the abdominal cavity is too small, a mesh sack is stitched around the borders of the defect and the edges of the defect are pulled up. The sack is called a silo. Over 5 to 7 days, the intestine returns into the abdominal cavity and the defect can be closed. Other treatments for the baby include nutrients by IV and antibiotics to prevent infection. The baby's temperature must be carefully controlled, because the exposed intestine allows a lot of body heat to escape. The baby has a good chance of recovering if there are no other problems and if the abdominal cavity is large enough. A very small abdominal cavity may result in complications that require more surgeries. Plans should be made for careful delivery and immediate management of the problem after birth. The baby should be delivered in a medical center that is skilled at repairing abdominal wall defects. Babies are likely to do better if they do not need to be taken to another center for further treatment. A small number of babies with gastroschisis (about 10%) may have parts of the intestines that did not develop normally in the womb. With these babies, their intestines may not work normally even after the organs are put back inside the abdominal cavity. The increased pressure from the misplaced abdominal contents can decrease blood flow to the intestines and kidneys. It can also make it difficult for the baby to expand the lungs, leading to breathing problems. Another complication is bowel death necrosis. This occurs when intestinal tissue dies due to low blood flow or infection. This condition is apparent at birth and will be detected in the hospital at delivery if it has not already been seen on routine fetal ultrasound exams during pregnancy. If you have given birth at home and your baby appears to have this defect, call the local emergency number (such as 911) right away. Gottlieb LJ, Reid RR, Slidell MB. Pediatric chest and trunk defects. In: Rodriguez ED, Losee JE, Neligan PC, eds. Plastic Surgery: Volume 3: Craniofacial, Head and Neck Surgery and Pediatric Plastic Surgery. 4th ed. Philadelphia, PA: Elsevier; 2018:chap 40. Walther AE, Nathan JD. Newborn abdominal wall defects. In: Wyllie R, Hyams JS, Kay M, eds. Pediatric Gastrointestinal and Liver Disease. 5th ed. Philadelphia, PA: Elsevier; 2016:chap 58. An abdominal hernia (gastroschisis) occurs when there is an area where the muscles are weak, and this allows the internal organs to bulge through the abdominal wall.